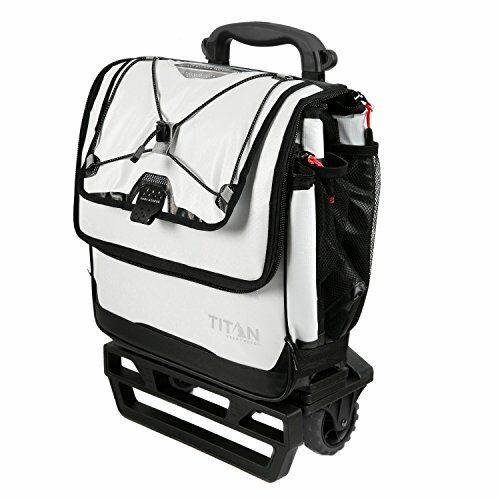 The Titan Deep Freeze 60 Can Rolling Cooler keeps ice up to 3 days! Deep Freeze high performance insulation with radiant heat barrier and triple layer ColdBlock base combine to create superior cooling. The cooler’s exterior is constructed of tough, water and stain resistant Rhino-Tech and also includes an expandable, insulated front compartment. The detachable All Terrain Cart features an expandable, extra wide base, all terrain wheels, retractable, telescopic hook ‘n’ go handle and can hold up to 100 lbs./45.4 kg. If you want to use the cooler without the cart, the Backsaver adjustable shoulder strap centers load weight to help make the cooler easier to carry. Both the cooler and cart collapse for easy storage. Features an adjustable Backsaver shoulder strap with shoulder pad; The All Terrain cart is expandable, removable, and can carry up to 100 lbs.